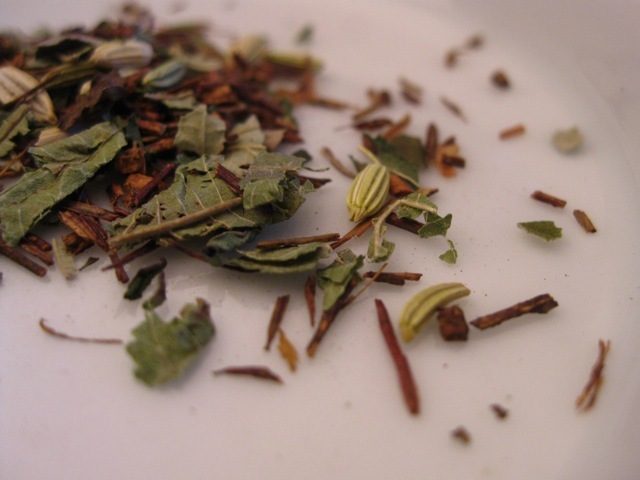 This rich full-bodied tea brews to a reddish orange liquor. The chocolate pieces create a creamy taste and the mint is bright and refreshing. 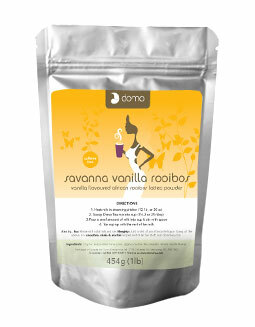 This Chocolate Mint Rooibos tea can be consumed both as a hot beverage and as an iced drink. Yum! This is good stuff! The aroma is delicious – very minty, but with a nice chocolate-y scent too. 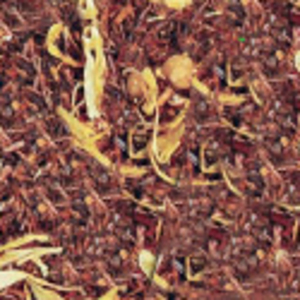 I can also smell the rooibos … which smells like, well, like rooibos. I am happy that I can’t really taste the rooibos, though. Perhaps a faint nutty flavor or woody flavor here and there, but nothing very pronounced or strong. As I am not particularly fond of the flavor of unflavored, oxidized rooibos, I find the lack of rooibos flavor here to be a good thing. The strongest flavor is the mint. The taste is clean and crisp, just like I’d expect from a strong minty taste. The finish is minty fresh with just a whisper of chocolate. This would be a great low-calorie, low-fat, caffeine-free dessert substitute! Delicious! For the free spirited woman on-the-go, these teas we designed with our founders alter ego in mind, and packaged in a stylish tin with T-sacs. Red, white and blue, oh how I love you. Hats off to our all American blend of Pomegranates, coconuts, blueberries and yummy rooibos. No caffeine so you can lull yourself to sleep with the ocean waves. 60g Tin. “What Ever Floats Your Boat” has always been one of my favorite cliches so when I saw the name of this Rooibos I HAD to try it! Then when I saw the “Free Spirited Woman On The Go” description I knew it was for me! “But Wait! There’s More!” THEN when I saw the ingredients I was delighted and REALLY couldn’t wait to try it! It sounded so plump and juicy and mouth-watering! When I opened the pouch it not only lived up to the aroma – it lived up to the name! It’s a very colorful dry mix! Post infusion – the coconut gives it a slight oily texture on the top but the actual color of the tisane is a vibrant toned down brown-orange…very nice! 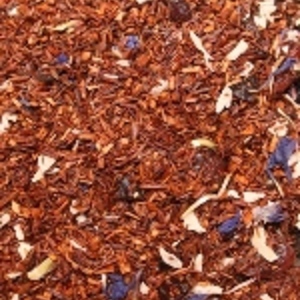 It has a nice strong Rooibos flavor but the blueberry and pom join hands in harmony and the coconut flavor does give it a semi-tropical yet milky-smooth flavor, too! 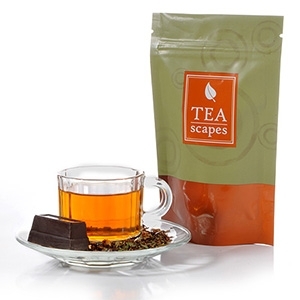 This is another good one from White August Tea Company and a very tasty flavored rooibos! A sweet symphony of toffee and caramel flavours make this a nice after dinner treat. Years ago I had a candle business on the side. By that I mean I resold candles…I didn’t make or blend them myself but I was constantly smelling candles looking for the most powerful aroma with closest possible “smell-match” to the description. This was one of those flavors that was hard to match – at least in candles, that is. I was able to find all sorts of Creme Brulee Scented Candles but they all smelled different…completely different! I ended up finding a local crafter nearby that got the smell “Right On”. That’s what the aroma of this flavored Rooibos reminded me of…that perfectly scented Creme Brulee Candle I found years ago! Since then I have moved on to other things and no longer sell candles but one thing that stuck with me was smelling everything! And I mean EVERYTHING! My mother laughs at me because if we go to the market I smell the fresh made bread…I still smell candles when I come across them…I smell ALL my teas (that’s why I almost always include the aroma of them in my reviews)…and now that we are selling another line of natural foods – I have been smelling everything that is available in our catalog! Having said all that…the aroma of this Creme Brulee from Tea Oh is amazing! It’s Creme Brulee to the fullest extent! The taste is a little lighter than I thought it would be…more subtle. It’s like this…you have your Rooibos and then you have your flavoring…so…in short, it’s a good flavored rooibos but you can still taste the rooibos. I really did enjoy my cuppa but the aroma was what got me with this one! And it sure did stir up some memories! Thanks Tea Oh! Nicely Done!